Retirement age has to come even if you don’t want it to come. It is a phase of life every person has to face one day. One has to start planning for his life after retirement as soon as he/she starts his/her career. You have to do all the planning by yourself as unfortunately there are not good enough retirement planners available. People who do not plan their life after retirement may face difficulty in terms of financial matters at the old age. Retirement financial planner helps in setting your retirement objectives and guides you in estimating how much of money you will need when you will get retired. The template design for this purpose is easy to use. It will automatically calculate the required savings you need every year to accomplish your target goals and objectives just by providing it your age, current annual salary, current savings and any returns you get on investments. 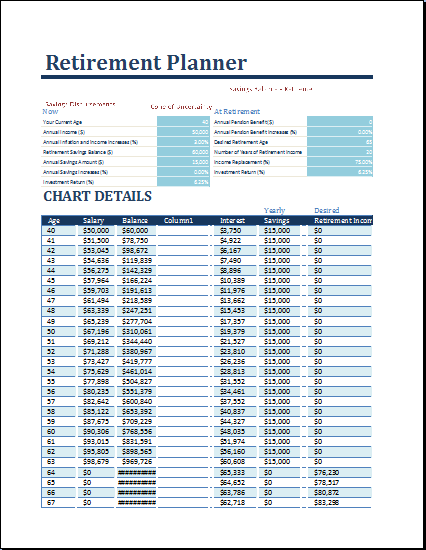 You do not need any other planner format if you have this amazing retirement financial planner with you. Get advantage by this and secure your old age so that you can never fall short of money. Start saving money as soon as you can and obviously as much as you can. Don’t linger on long to start saving. Initiate it at your young age to have a big huge amount for your after-retirement life. At the end, you will be happy when you see a reasonable amount enough to live a comfortable old age life.